One can feel quite exhausted following a reading of the Gospel of Mark’s account of a day in the life of Jesus – today’s text Mark1: 29-39. There is a lot packed into the day so described. It is typical of Mark’s story-telling style – rapid, clipped, urgent, sparing of detail. It gives a picture of a Jesus who is in total command. For Mark’s original community under heavy persecution and the threat of annihilation under Nero, it was strengthening to know that, even as they felt the breath of the hungry arena lion or the heat of the first flicker of flames at the stake, that the One in whom they had invested their total trust would hold them tight. Mark tells us of no easy fix, no plastic action figure to save the day, but the trustworthy authority of Jesus who is also the Christ. Easter memory loss makes plastic of the present – Eureka Street. 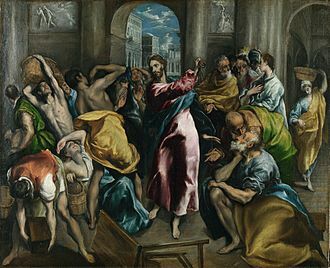 The story of Holy Week sometimes begins with Jesus “cleansing the Temple” – turning over money trading tables and driving out sacrificial animals being sold under extortion. An arresting offence, no doubt, and certainly would have been a factor in his eventual capture and trial a few days later. 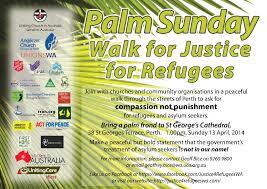 In Perth we see Holy Week begin with the arrest of 11 protesters following a deliberate and similarly prophetic action. The best account of what happened and why is found in their own words. 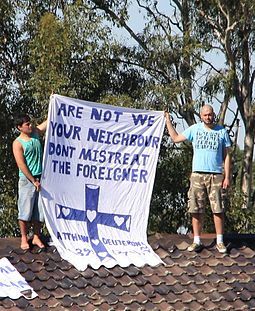 Read it at: Why we held a sit-in over child detention ahead of Easter. What is evident in their story and the varied community reactions is a refusal to allow focus to be diverted from the initial purpose of drawing attention to the 1000 plus children of asylum seekers held in detention. Following the best non-violent practices of Dr Martin Luther King, they hope to turn the tide of public opinion towards abhorrence of this cruel practice, eventually leading to a humane bipartisan approach for a regional response to all men, women and children who flee danger. But this is only the beginning of Holy Week. The Easter story tells of passion, trial, pain, crucifixion, deposition, desolation and finally new beginnings through resurrection. Followers of the Way know that all these may be encountered before purpose is realised. What drives Palm Sunday Peace Parades? On Sunday, many thousands will march for peace. In Perth, leaving from St George’s Cathedral at 1 pm, those gathered will join others around the country in marching for justice for refugees. Inspiration for Palm Sunday Marches has a long tradition of drawing on the story of Jesus riding into Jerusalem on the eve of his Passion. Like a king of ancient times, he rides through the city gates, not as a conquering despot, but as a focus for the kind of peace the Bible calls shalom – complete integrity for all of creation expressed in whole relationships, especially in terms of justice and righteousness. Today’s text, Matthew 21:1-11, gives one rendition. Marcus Borg draws attention to two triumphal entries into Jerusalem that day. One by Roman governor Pontius Pilate, representing the power and military might of empire to keep order and maintain the status quo – the other by Jesus, ushering the dawn of a new era heralding justice and peace. What these two triumphal entries represent is the continuing tension between the push to maintain the comfort of order and equilibrium, no matter how unjust, and the pull towards transformation towards comprehensive healing, integrity and wholeness. Jesus’triumphal entry into Jerusalem thus becomes a powerful focus and icon for many who will march this Sunday. This article touches on a huge source of anxiety among refugees on bridging visas and living in communities such as ours. A High Court challenge is a flickering sign of hope that our Kafka-like systems will find an inch of redress. The toxic political polarisation that soaks our our waking moments, however, will take something more. 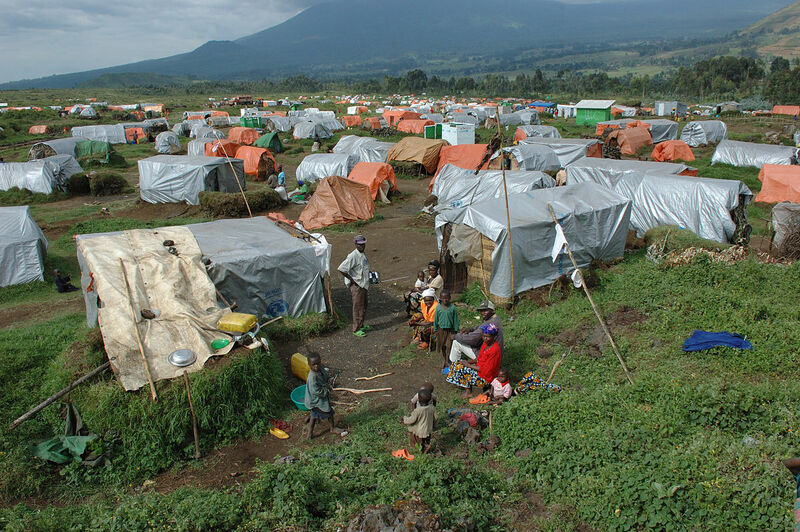 Refugees in the dark over security checks – Eureka Street.